Developing an effective product roadmap requires more than a product manager’s intuition and vision, although those elements are crucial. But equally important for an effective roadmap will be evidence, real-world data, and a scientific approach to analyzing that data. In this post, I’d like to share with you some ideas for identifying, tracking and leveraging the right metrics to help shape your product strategy. These are some of the ideas that I shared in a recent webinar that we co-hosted with Pendo, called “Building Data-Driven Product Roadmaps”. Vanity metrics are stats that look great in a press release but don’t necessarily translate in any meaningful way to business results. Examples include the number of Twitter followers or how many people have watched a clever video your company posted on YouTube. In reality, these numbers give you very little insight into how your product will resonate with customers or how much revenue it will generate. Worse, when you rely on these sorts of metrics — which can be tempting, because they suggest interest and engagement with your company — you risk developing a very skewed view of the actual level of interest in your products. People watch YouTube videos and follow companies on Twitter for lots of reasons, many of which have nothing to do with an interest in those companies’ products or services. Another important point to keep in mind is that with services like Google Analytics, it’s possible to track many different types of data. And that’s great. But trying to make sense of an overwhelming amount of data can also lead to confusion. You probably have a firehose of information available to you right now, so you should first try to figure out what the most important metrics for your product are. This includes the data that will lead to the most valuable and actionable insights into what’s working with your product, what isn’t resonating with users, and how you can continually improve your offering. 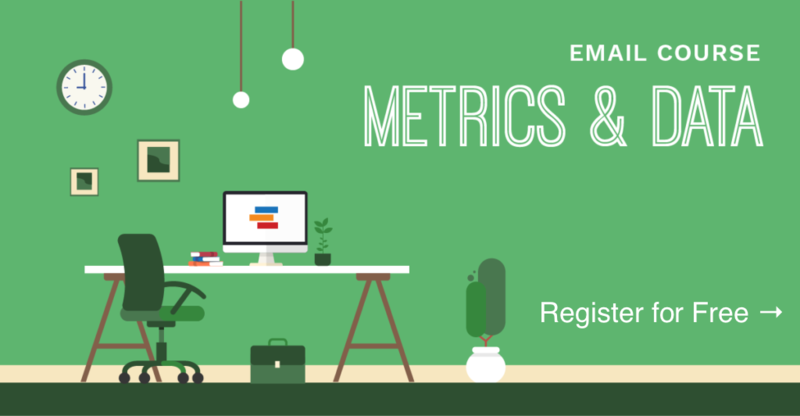 The ideal number of metrics to track will vary from company to company, of course, but a good rule of thumb is to focus on roughly five metrics that you can monitor over time and discuss regularly with your executive stakeholders. Assuming you’ve identified the five most revealing and strategically advantageous metrics to concentrate on, the data you compile from these metrics over time should give you valuable intelligence into how to proceed with your product and what to prioritize on your roadmap. First, you have to set your product’s strategic goals. Before you can begin sifting through all of the noise and determine which handful of strategically useful metrics to focus on, you need to define your product’s strategic goals. Then, when you’ve set those goals, you can start looking for the right mix of metrics to track and analyze, the metrics that will help you achieve those goals. Next, start compiling data — here are some great places to look. If you already have a product on the market, with an installed base of users, you can choose from a wide range of real-world metrics to track, which will help you take a more scientific approach to deciding where to focus your resources. To use my own company as an example, at ProductPlan we pay close attention to a handful of these metrics all the time, and they are extremely helpful in guiding how we pursue and adjust our strategy. One of the great things about offering a SaaS-based product, which we do with our product roadmap software, is that because you are continually tracking everything in the cloud, you can view and analyze an incredible amount of detail about how your customers are interacting with your product. Even though we don’t have access to our customer’s roadmaps for security and privacy reasons, we are aware, for example, of how many product managers using our software to share their roadmaps with others across their organizations. This helps us to determine whether our tool is encouraging communication across the company and whether there are things we need to do to make the process easier or more intuitive for our customers. And if there is a common point in the roadmap development process where customers tend to reduce their interaction with our product, that gives a signal that we might need to revisit that part of the user experience and streamline or refine it. These could include industry experts, or the widely read columnists and commentators who write and speak about trends in your industry and review your competitors’ products. The researchers who cover your industry are an excellent source of information about which metrics offer the most significant clues as to what will constitute a successful product. These are the people, after all, who spend their days listening to briefings from your competitors about the things they’re finding resonate with their customers, and who then write detailed reports about which products are enjoying the most success in your industry, and why. Unless you’re planning to create an entirely new category with your product, chances are you have competitors with products already on the market. And chances are those competitors have done a lot of the research into the most strategically useful metrics relating to their products and their customers, and may have public information available, especially if they are a publicly-traded company. You can leverage this information in developing your own set of metrics to focus on. You can find your competitors’ discussions of what they deem important data points in their press releases, on their earnings call with analysts (assuming they’re publicly traded) and even in their own business filings online. To this point, I’ve been discussing the importance of using a small set of key metrics as a way to help you shape your product strategy. But another important reason to track and analyze these metrics — equally important in helping you successfully bring your product to market — is that they will give you a set of concrete evidence to share with your executive stakeholders over time, to help them understand and support your strategic decisions for your product. One of the most effective ways to communicate your product strategy with your stakeholders, and to share with them the evidence that supports your strategy, is with a visual, intuitive product roadmap. As you can see from the screenshot below, depicting a roadmap developed using ProductPlan, when you use the right roadmapping tool you can visually articulate your product’s strategic goals, and then build into the roadmap the data points that support your decision to pursue each of those goals. 2. Next, make a list of possible strategically advantageous and illuminating data points to track — such as customer-oriented metrics like product usage, and business-focused metrics like customer acquisition cost. 3. If you don’t have a product already on the market (or even if you do), you might also want to research your industry for strategically important metrics to focus on. To find these metrics, check in on what your industry’s luminaries, media, analysts, and competitors are focused on. 6. Now you can build this strategy (including the data points supporting it) into your product roadmap, which you can then share with your executive stakeholders — demonstrating to them that you’ve brought evidence, and not just your intuition, to these strategic decisions. At the point, I’d typically wish you luck with your product’s success. But now you’ve got evidence backing your strategy — so you won’t need luck. How specifically do you recommend establishing your product’s strategic goals? I would look forward to a blog post on this aspect specifically. I think a lot of people struggle with developing a product vision and roadmap of strategic milestones that need to be achieved. Thanks! Hi Darren, thanks for the question. We’ve written a lot about developing strategic goals. I agree that a lot of product managers struggle with this! Do you have any recommendations for how to measure product adoption and usage? Hi Kate, Here are some ways measure product usage and adoption: Measure overall sign-in frequency, sharing and other metrics to gauge whether your users are increasing usage or adoption over time. You can also look for the percent of users who take a specific action that might be a predictor of higher customer lifetime value. For example, is their data entry increasing and is that a predictor of future license purchases? There are some great products coming on the market for PMs to measure activity and usage so you can make better decisions. But I recommend focusing on only a few key things to measure.